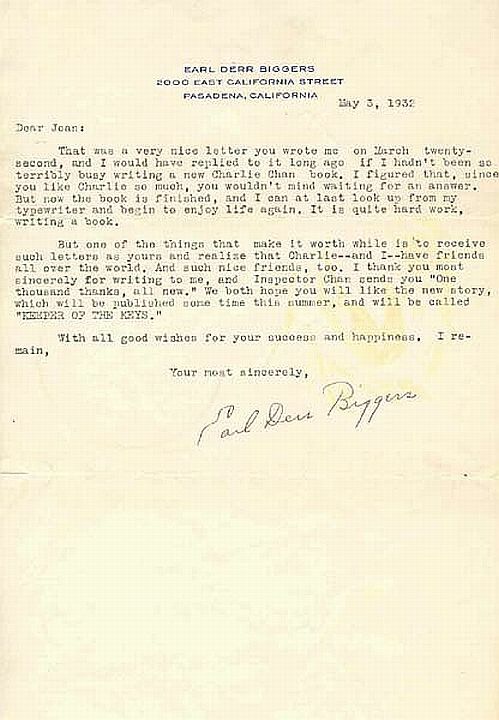 That was a very nice letter you wrote me on March twenty-second, and I would have replied to it long ago if I hadn't been so terribly busy writing a new Charlie Chan book. I figured that, since you like Charlie so much, you wouldn't mind waiting for an answer. But now the book is finished, and I can at last look up from my typewriter and begin to enjoy life again. It is quite hard work, writing a book. But one of the things that make it worth while is to receive such letters as yours and realize that Charlie--and I--have friends all over the world. And such nice friends, too. I thank you most sincerely for writing to me, and Inspector Chan sends you "One thousand thanks, all new." We both hope you will like the new story, which will be published some time this summer, and will be called "KEEPER OF THE KEYS."